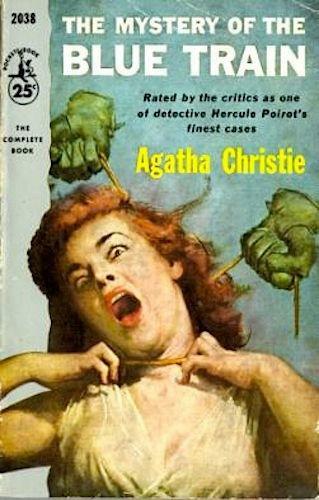 I had to re-read this classic Agatha Christie novel after recently seeing the Kenneth Branagh movie version. I have always been a huge fan of David Suchet and his version of Christie's most famous detective, Hercule Poirot. I was initially horrified at the promotional photos of Branagh's take on the inimitable Belgian's famous 'stache, but I actually enjoyed his lively take on the character. Maybe some of that enthusiasm carried over when I was reading the novel, which is not as smooth or fast-paced as its many screen versions. But I found myself not getting caught up in Christie's clues and red herrings (a dropped pipe cleaner, monogrammed handkerchief, etc,) and instead enjoyed his conversations with a train full of suspects and his unique take on the solution of the crime. Can Branagh's Poirot and his magnificent mustaches solves the case? Christie didn't just set one murder on the famous and luxurious Orient Express, or Blue Train, as it was sometimes called. Poirot shows up about halfway through the book, written before Murder on The Orient Express. The mystery features plenty of adultery and romance, centering on a married couple who are both involved with other partners. Christie is said to have not liked this book, but that may be because she was writing it both before and after her infamous disappearance and the dissolution of her first marriage. Whether she liked it or not, Poirot is at his most charming - flirting with young ladies on the Riviera while he tracks down a murder and solveds the disappearance of a famous ruby known as the "Heart of Fire." This is an O.K. biography of Agatha Christie. The author gives a brief biography of her life, leaning heavily on Christie's own autobiography for the majority of her quotes. Readers who are not familiar with all of the author's intricately plotted books might want to steer clear of this one, as major plot points and solutions are revealed. It is a fun but slim read for the Christie-phile who might want to learn a little bit more about the author, including lesser known features of her life, like the numerous long-running plays she wrote when not cranking out her best-selling mysteries, and the romance novels she wrote under the pseudonym Mary Westmacott. This book was just ... strange. It tells the story of Lori Holmes, definitely no relation to Sherlock, who comes home from college with her boyfriend/fiance to find out that her parents are dead and her childhood home has burnt down. Bloch, the author of Psycho, seems to not know whether this should be a supernatural thriller or murder mystery. Not that a book can't be both, but this book never seems to find its voice. Lori has strange, sometimes disturbing dreams, but she seems to be more a girl of the 50s than the almost-90s. She passively accepts tons of tranquilizers from the men in her life who just want to shut her up. And most of those said men have mustaches, and similar attitudes, so seem hard to tell apart. Were mustaches really a thing in 1989? I remember men being more clean-shaven. Anyway, it's not horrible, I got through it, but not so good, either. It was more than a little hard to hang in there to find out if any of Lori's dreams or hallucinations would pay off.